A weekly video game & movie podcast with new episodes every Monday just for YOU! Enjoy the show 3 days early at Patreon.com/joygasm Geek out with Russ (Xbox Live: T0ASTER360) and Steve (Xbox Live: Stevavitch) as they banter on video game & movie industry news, share hands on impressions of their gaming adventures on Xbox, Playstation, Nintendo, and mobile, provide in depth movie reviews, and discuss trending pop culture topics. If you crave pixel goodness, memorable moments, and experiences that make your inner child do the happy dance, you’ve come to the right place. Welcome to Joygasm – A Video Game & Movie Podcast! We heart gaming. Joygasm is our platform to geek out and share with you our wonderful interactive adventures be it on Xbox, Playstation, Nintendo, or mobile. The next best thing to being told a great story is to geek out about it afterwards. Joygasm loves to review & analyze Hollywood visual storytelling. Exciting news and amazing creativity means there’s never a dull moment. Whether it’s comic con, the hottest new collectible, or community events, we love to chat about it. Achievement Unlocked – Celebrating Our 100th Episode! Choose a podcast app of your choice; the native podcast app on iPhone, Google Play on Android, or a 3rd party app all work just fine and dandy. 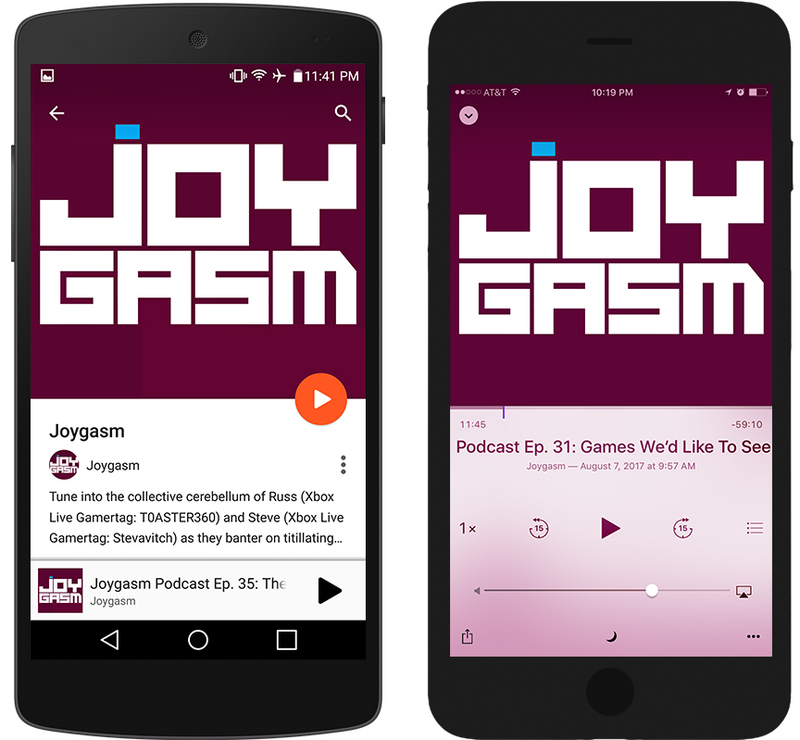 Next access the search feature in your podcast app of choice and type "Joygasm" into the search field. You should only have to wait a tick. Tap the "Subscribe" button and before you know it, saucy episodes of Joygasm will be downloaded to your mobile device. Please don't forget to rate & review our podcast! Join us...it is your destiny. We broadcast our gaming adventures and you're invited! Swing by and say hello.